Melbourne for Dogs book is here! 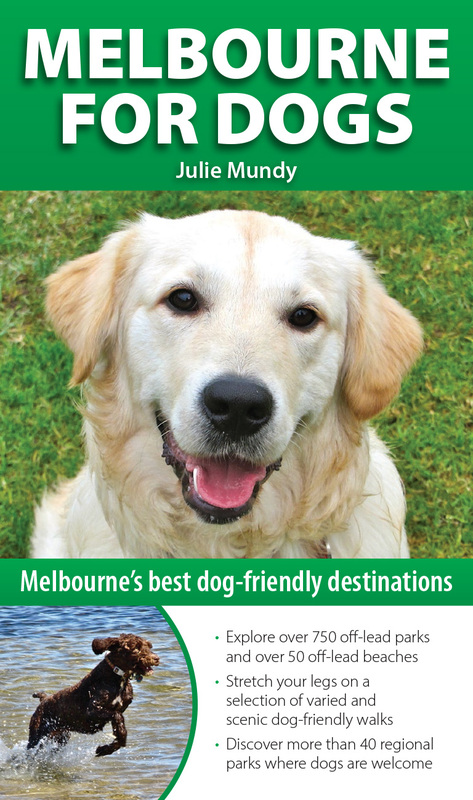 Melbourne for Dogs – who could resist that brown-eyed retriever? Not me! I can’t believe it’s been almost 3 months since I managed to update my blog! Well, actually I can, as I have been pretty busy, with work trips to Mongolia, Canberra, Hanoi and Cambodia since then (plenty of stories and sights to share). But my big news is that the first copy of my new book, Melbourne for Dogs, has just arrived in my hot little hands today, as an advance copy from the printers. Honestly – the anticipation has been almost too much to bear – it’s been somewhat like an elephant’s gestation, 2 years in the making and finally it has popped out fully formed in glossy, glorious colour! RSPCA Victoria have come on board and endorsed it, which is wonderful, and we’ll be launching it at the Melbourne Dog Lovers Show, which will be at the Royal Exhibition Building in Carlton from 2nd – 4th May 2014. You can pre-order it from Woodslane online, or after the show, it will be available in all good bookstores and online, as well as through RSPCA shops, and some vets and pet stores as well. It will retail for $24.95, but if you buy one at the show, it will be on special for $19.95. 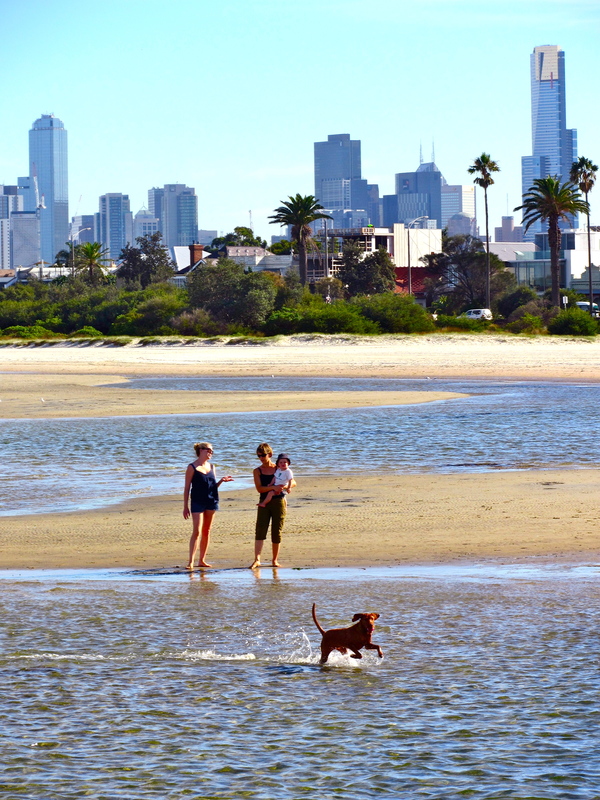 There are over 700 off-lead dog parks and 50+ off-lead beaches in there, as well as a series of longer dog and people-friendly walks to keep you entertained, in the style of the Melbourne’s Best Walks book. I do hope you and your pooch enjoy using it to explore (off-lead) pastures new – Indie and I certainly enjoyed researching it! Sometimes you forget that the nicest walks are in your own backyard. After a very hot 30C day yesterday, and just before the first clouds of mozzies descended, the kids and I headed out for fish and chips down at Station Pier in Port Melbourne, then walked along the promenade past Princes Pier where many of our soldiers embarked for northern wars in the last century. 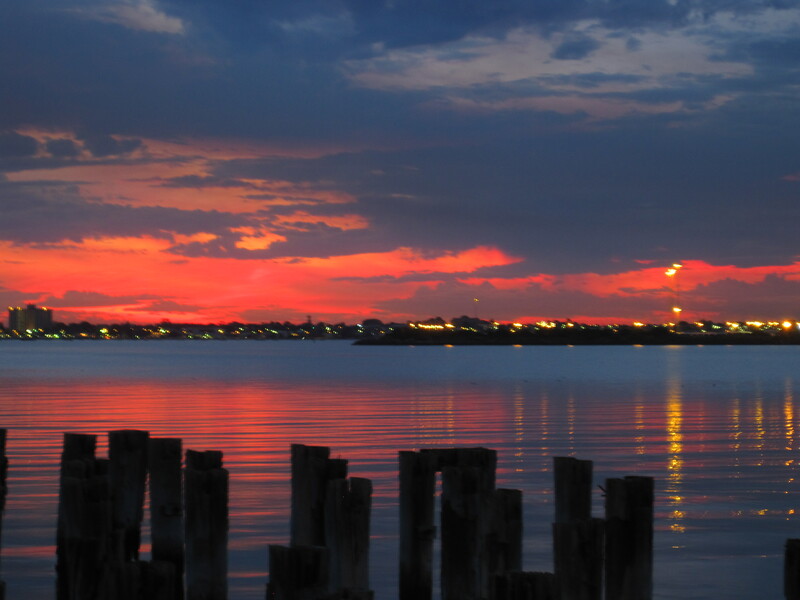 This beautiful sunset was showing off to everyone across the old pier’s pylons, and plenty of people were out walking, enjoying the gentle evening breeze. Further along and the walkway continues past quiet Sandridge beach, which is marked by recovered pier timbers engraved with the names of the old boats which sailed into Melbourne, bringing hopeful new immigrants arriving at Station Pier, eager to start a new life. Sad that we seem to have forgotten that, with notable First People exceptions, we were all boat people once. Melbourne for Dogs – some news! Well, here’s a bit of excitement (for me, anyway!) 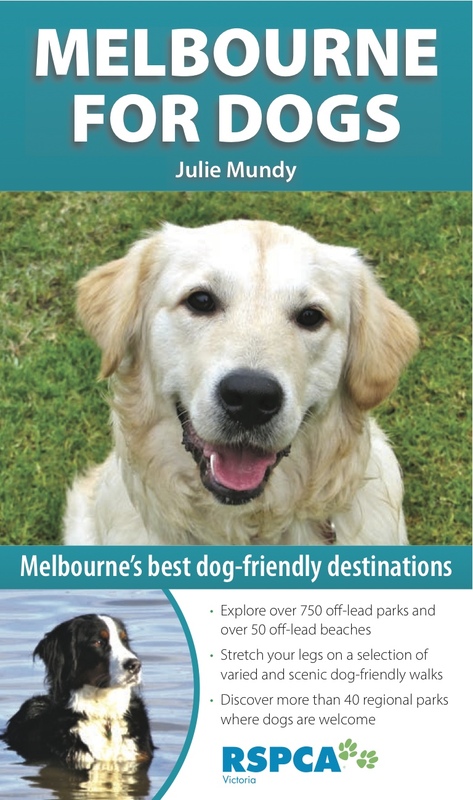 – a sneak peek at the cover for Melbourne for Dogs has just arrived from the publishers. How can you resist the gorgeous golden retriever on the cover – she was at Cheltenham Park one overcast day in the winter, melting hearts all over – and yes, that’s a very mental looking Indie having fun in the water down at St Kilda West beach – we headed there yesterday to escape the heat and spent lots of time wading through the waters at low tide. 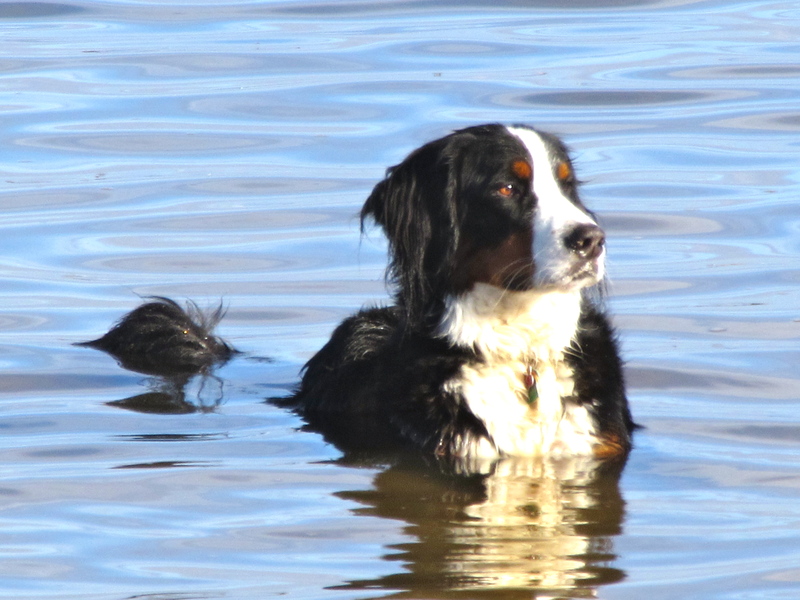 Great way for dogs and their humans to cool off. The other bit of exciting news about Melbourne for Dogs is that the book is going to be launched at the Melbourne Dog Lovers Show on 2nd-4th May next year at the Royal Exhibition Buildings in Carlton, where there will be a big wall display of the more than 750 off-lead parks and 52 off-lead beaches in Melbourne (taken from the book), and little old me and the books! Looking forward to meeting some of you there! While out walking in Melbourne’s western bayside suburbs today, I spotted these enterprising lads, who obviously decided to take the short cut from Altona across to St Kilda. Hope they packed their snorkels! 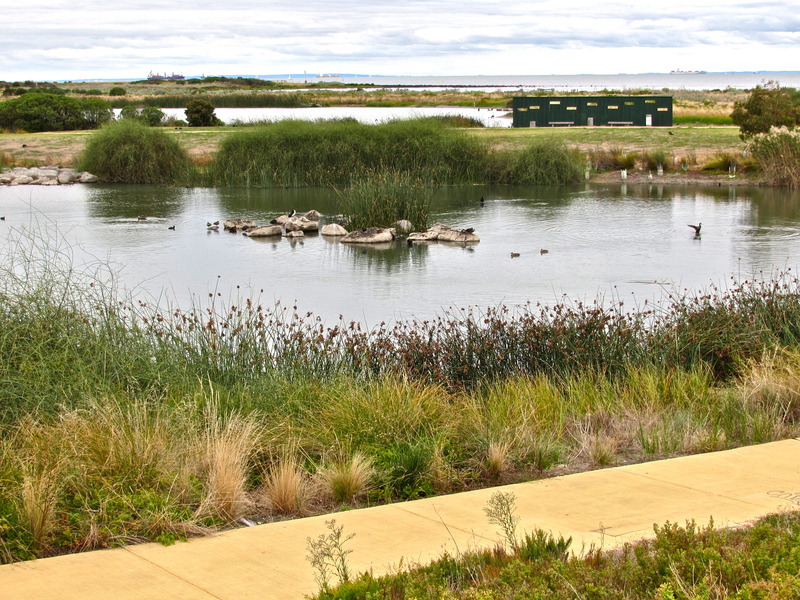 I opted for the longer route, and took in a fine 8km stretch of the Williamstown to Altona Foreshore Trail, a shared cycle/walk path which winds along the coastline from Williamstown Beach across to the fabulous off-leash PA Burns coastal reserve in Seaholme. While the Foreshore Trail itself is on-leash for dogs, (it runs parallel to the Jawbone Conservation area), the parks at either end of the walk are both off-leash, so plenty of exercise for everyone – particularly those whose dogs like a good run (or in the case of these kids, swim) beside the bike. As our extended summer in Melbourne draws to a close, I am just finishing the chapter of Off Leash Dog Beaches for the Melbourne for Dogs book. What a trial that has been for my co-author and I. We both just hate having to walk barefoot along the sandy beaches of Port Philip Bay on sunny days, with views all the way to the Peninsula and daily sunsets to set the heart singing. Indie particularly hates having to roll in the sand and dig holes and jump over the (mini) waves to play with all the other very happy dogs. What a drag. Our favourite, thanks to its proximity to home, is St Kilda West Beach, with it’s huge piles of dog-friendly new sand being pushed out to help build the extension to St Kilda marina. Brighton dog beach is the place to go on Sundays when every man/woman and his dog (literally) is out there to enjoy the views and the company. But today we’re heading over to the Altona dog beach, in Melbourne’s west, aiming for low tide when there are endless stretches of flat sand revealed for dogs and their owners to stretch their legs on. 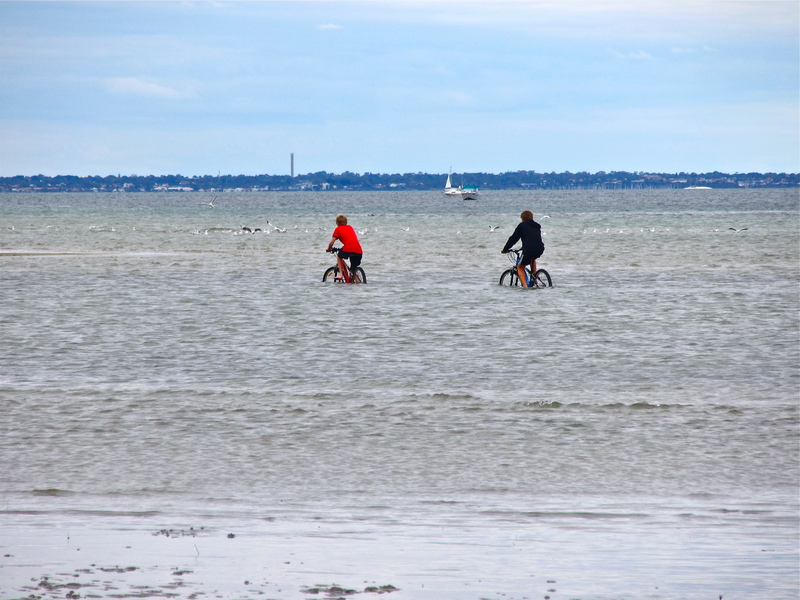 In fact, the shallow, calm waters of Port Phillip – the bane of tourists looking for a decent wave – make for fantastic waters for dogs, and the many off-leash beaches available around the Bay feature extensive sand flats and shallow waters at low tide perfect for bounding through and wallowing in. Life’s good if you’re lucky enough to be a dog in Melbourne! 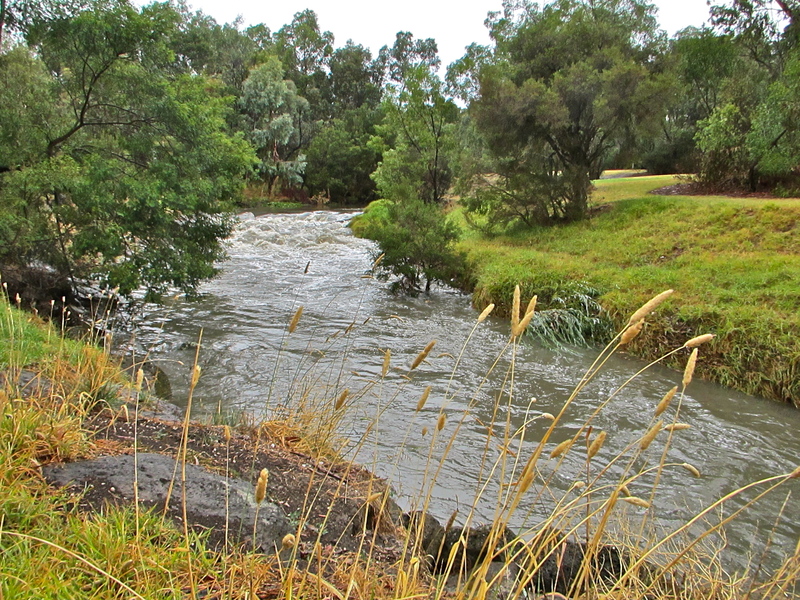 Gardiner’s Creek Reserve – Great for Dogs when not flash flooding! Am finally into the nitty gritty of Melbourne for Dogs, and decided to check out some reader recommendations for great off-leash dog walks. Gardiner’s Creek Reserve in East Burwood, right next to the Deakin University campus was top on my list. And of course after weeks and weeks of unremitting 30 degree plus heat, the designated day dawned ….. bucketing rain, fabulous lightning and thunder and radio warnings of flash floods! Well, that was annoying. After an hour, it eased up so I thought I’d give it a crack anyway. My enthusiastic co-author was all for it, so we picked up our trusty two-legged companion, Deb and headed north. My readers are right – Gardiner’s Creek Reserve is just perfect for off-leash bound-y dogs, with around 2.5km of tracks through the manicured bush reserve and the opportunity to get their feet wet in the meandering creek – though thanks to all the rain, the creek was more a roaring torrent, so even Expeditioner Indie had to keep her distance or risk taking a water-slide detour to Port Phillip Bay.